Voodoo Dreams Casino is operated by SuprNation Limited. The company is licensed and regulated in Malta by the Malta Gaming Authority. Voodoo Dreams was launched in 2016 and is a magic-themed NetEnt Casino. Players get to earn different types of points so that they can cast spells and advance to further levels. The casino offers a wide selection of over 800 games from the top software providers in the industry, such as: NetEnt, NextGen, Elk Studios, Microgaming, Betsoft Gaming, Williams Interactive, Quickspin, Play ‘n Go, Thunderkick, Yggdrasil Gaming, Scientific Gaming, and NYX. 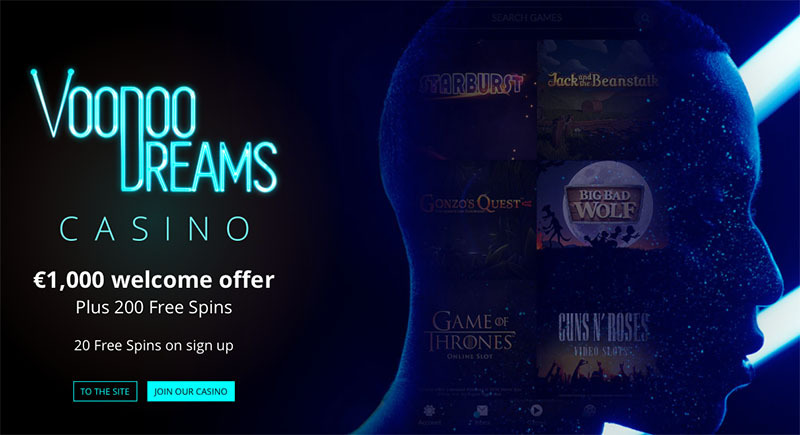 Check out the full Voodoo Dreams Casino Review below for information on the Welcome offers, deposit and withdrawal information. How do I play at Voodoo Dreams Casino? The gameplay at Voodoo Dreams is different from other online casinos. Players can earn two different types of points: Experience Points (XP) and Spirit Points (SP) whenever they play at the casino. Players collect XP whenever they play and this determines the Voodoo level on which you are on. The more XP points earned, allows the player to progress to higher levels – thereby allowing you to more access of more powerful spells. With each new Voodoo level reached, 4 new spells can be cast. Players collect SP through playing games and through accepting promotions at the casino. Players need to collect enough SP to be able to cast the spells that are unlocked. Why do I need to cast spells? When you cast spells, you receive rewards in the form of free spins, deposit bonuses, and real cash. Minimum deposits are a low €10 only. Players can really get into the gameplay at Voodoo Dreams (casting spells, advancing to higher Voodoo levels etc). Payouts and processing times are reasonably fast. Progressive jackpot games such as Mega Fortune, Hall of Gods, Mega Moolah, and Arabian Nights are available. At first sight, the casino layout can be confusing to understand. However, once players get acquainted to the website, gameplay becomes easier. All new players can sign up for a Voodoo Dreams Casino account to receive their 20 No Deposit Free Spins on the Book of Dead Slot. *Players will receive their 180 free spins over 9 consecutive days (i.e. 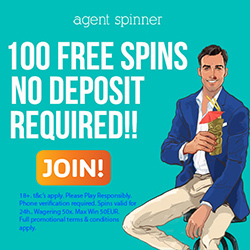 20 free spins per day). Free spins can be played on the following game: Book of Dead Slot. The minimum deposit amount to qualify for the Welcome bonuses is €10 or equivalent. The wagering requirement for the Welcome bonuses is 40 times. The wagering requirement for Free Spins winnings is 40 times. When bonus money is in play, the maximum bet per spin is €5. The following games do not contribute towards meeting wagering requirements when bonus money is used: Tower Quest, Champion of the Track, Robin Hood, Pearls of India, Royal Masquerade, Tomb Raider 2, Dead or Alive, Untamed Bengal Tiger, Super Monopoly Money, Untamed Giant Panda, Untamed Wolf Pack, 1429 Uncharted Seas, Koi Princess, Dr Jekyll & Mr Hyde, Ladies Nite, Game of Thrones, Scrooge, Spring Break, Eye of the Kraken, Blood Suckers, Lucky Angler, Big Bang, Forsaken Kingdom, The Wish Master, Devil’s Delight, Untamed Crowned Eagle, Double Dragons, Divine Fortune, and Castle Builder. Only players from the following countries may accept Welcome bonus offers, free spins offers, and other bonus offers at the casino: Finland, Germany, New Zealand, Canada, Austria, Switzerland, Malta, Sweden, and Norway. The deposit options at Voodoo Dreams Casino are: Zimpler, entercash, Visa, Mastercard, Neteller, Skrill, and Trustly. You can deposit using the following currencies: GBP, USD, EUR, AUD, NOK, DKK, SEK, NZD, and CAD. For any queries, contact customer care via Live Chat (on the website), or email.